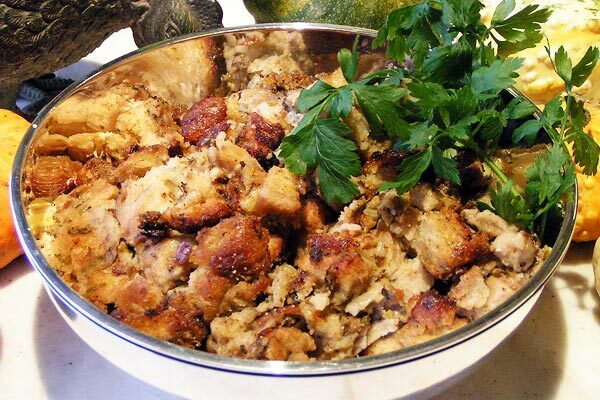 Normally I make plain bread stuffing for chicken but for a turkey I think you want something that a bit special. You can leave this meatless as well by leaving out the apples. But try this it is really good. Make half the amount and use it for stuffing a chicken. I have made my own Lugano sausage for the past few years due to the lack of there being a decent one on the market. Discovering Taylor and Jones has been a god send as they produce fresh hand made sausages in natural skins, making at least 35 different varieties. In this recipe I use Lincolnshire which are milder. You can very easily alter this recipe to suit your own tastes. Add 1/2 cup of dried soaked apricots and/or prunes chopped up. Nuts (chopped walnuts, hazelnuts or pecans) can make good additions as well. This recipe will give you enough for an good size turkey. 10-12 slices plain white bread cut into 2 cm cubes & dried in the oven. 335 gr sausage use Lincolnshire or another mild sausage. 2 medium eggs beaten and set aside. 100 gr white onion finely chopped and sauteed until they are soft. 100 gr celery finely chopped and sauteed until they are soft. 1½ t tbsp Bells Poulty Seasoning See clone below for a recipe. Begin by setting the oven to 100°F or , cut up the bread and dry it out in a baking tray. You can also do this by cutting it up the day before and leaving it out over night. Prepare all the ingredients, cut up the celery and onions, saute them in one tablespoon of butter, beat the eggs, melt the 100 gr of butter, chop the parsley, and cut up the apples. In a very large mixing bowl put in the bread cubes and all sprinkle over poultry seasoning and black pepper. Hold the salt until the very end of the preparation. Toss to mix well. Take the sausages and remove the skins, then with a fork mash the sausages until chunky and lightly saute it until they loose their color. They will finish cooking in the oven. Toss into the bread cubes and mix well. They like to clump up and go back together so keep and eye out that they are not too big. Another way is to leave the skins and slice them onto disks, Saute lightly and use them that way, I prefer the first suggestion. Pour over the beaten eggs and toss well to mix. Then pour over the melted butter and toss again. The idea is to evenly distribute these ingredients. Add the chicken stock a bit at a time mixing the whole mixture between additions until all the cubes of bread are softened and the liquid is evenly distributed. You might not need all of it and you don't want the cubes to get soggy. Now the salt, if you used home made unsalted chicken stock you will need about 3 tsp., if you used bouillon cubes which are salty you won't need much salt. Simply stuff this mixture into your turkey and sew or skewer the bird closed. This should give you enough for 1 large bird, stuffing both the chest cavity and the neck cavity as well. If you have extra stuffing, Butter an ovenproof bowl and bake it separately (approx 40 minutes) You can never have too much stuffing! Then prepare the bird as in my instructions for Roasting a Turkey. Let me say something about the salt. I don't give an exact measurement because I don't know what kind of stock or bouillon you are using. How salty the sausage you are using are. So its best to salt once you have it all together. It makes adjusting the salt easier. Grind all of these into a power. 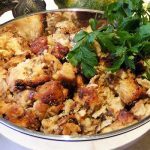 I love stuffing and its not a real roast turkey without it. As for the sausage I use large link fresh English Lincolnshire sausages bought at Taylor and Jones (Hantverkargatan 12 - 08-651 29 10) or find them at Högtorget in Stockholm. You can very easily alter this recipe to suit your own tastes. Add 150 grams of dates, dried figs, or dried soaked apricots and/or prunes chopped up. Nuts (chopped walnuts, hazelnuts or pecans) can make good additions as well. A note about the sausage: I am using an English Lincolnshire style sausage freshly made. They are mild, the main spice flavoring being nutmeg. They are similar to what we know of in the north eastern part of the US as being close to our breakfast sausages in taste. Not quite so spicy. You could if you like use vacuum pack Italian Lugano sausages but I think they might be a bit too strong. I would be afraid that it might get too porky and you don't really want to change the taste of the turkey.